Of all the metrics that L&D leaders should focus on when designing a leadership training program aimed at developing conversational leadership, if you were to choose just one, it should be self-awareness. There is an interesting correlation between the speed of development of self-awareness and the development of other leadership KPIs. This correlation is based on data from a digital role-playing platform that tracks over six million simulated critical conversations by over 250,000 leaders around the world. To illustrate the importance of monitoring self-awareness during a leadership training program, let’s use a case study in which a bank monitored the development of its 1,200 middle managers’ performance in critical conversations along with their development of self-awareness. The program was delivered over the course of 12 months, with each manager participating in an average of one role play per week. The bank observed an interesting correlation between the two variables. 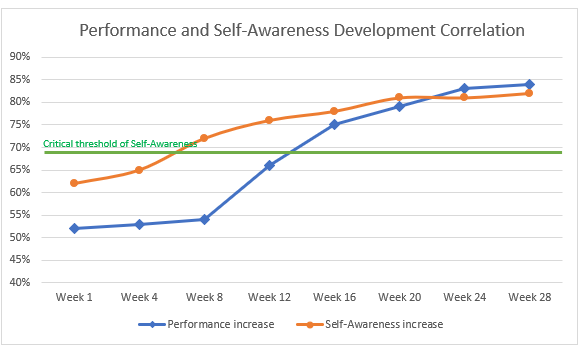 After eight weeks of practicing self-awareness, the managers crossed a threshold, at which point their performance started to grow at a higher speed. Until then, the overall performance in conversation management was growing at a very slow pace. We see this phenomenon frequently when analyzing the data from the role-plays. In fact, performance is related to learning agility, and learning agility is largely dependent on self-awareness. It is difficult for trainees to change their behavior until they are sufficiently aware of its impact. As self-awareness reveals their blind spots, learners start to change at a faster pace. Performance is related to learning agility, and learning agility is largely dependent on self-awareness. This evidence suggests that there is a threshold above which it becomes easier to turn experience into new behaviors and new behaviors into better performance. There is no fixed measure for a such threshold, of course; it may vary according to each individual, so rather than thinking in terms of averages, it’s better to shape a conceptual framework. In other words, a large majority of leaders appear to have an intermediate or lower level of self-awareness. This point is important, since the intermediate level is far below the threshold. Based on this research, you should devote a considerable part of leadership training to increasing self-awareness. Training in conversational leadership using digital role-play can accelerate the development of self-awareness. Human beings fear confrontation, but when confrontation happens, it is an opportunity for inner self-discussion. Digital role-plays are the safest way to make this confrontation happen. Additionally, the feedback session at the end of each simulation is an accelerator of that self-discussion. Training in conversational leadership using digital role-play can accelerate the development of self-awareness. Self-evaluation questions during and at the end of the conversation. Emotional feedback provided by the character at the end of the simulation. Objective metrics showing the outcome of the conversation. Objective analysis of each behavior used during the role-play and its impact. When these four factors come together, they maximize self-awareness. Andrea Laus is a serial entrepreneur who has founded several companies specialized in interactive e-learning content development and distribution. As CEO and founder of SkillGym, a high-tech company leader in the area of learning simulators focused on user performance improvement, he now leads a disruptive revolution.